Rijeka Crnojevića bridge, also known as Danilo’s bridge, is a bridge in the village of Rijeka Crnojevića. 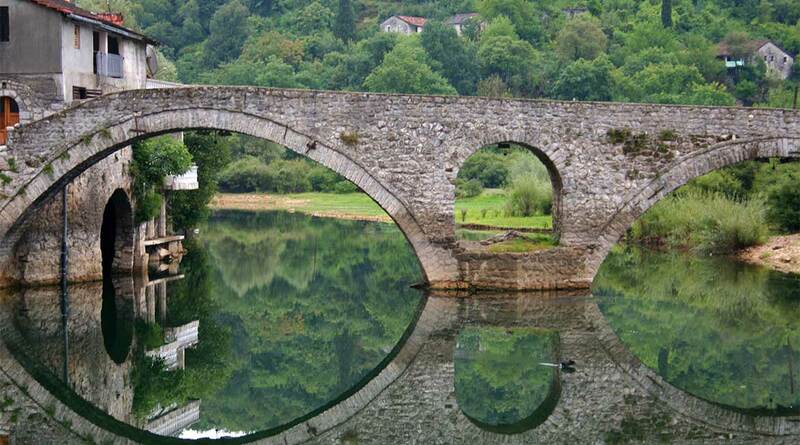 The bridge spans the Crnojević river and is one of the most important historical monuments and tourist attractions in the municipality of Cetinje. The bridge was built in 1853, by the Montenegrin Prince Danilo, who erected the bridge in memory of his father Stanko Petrović. On the left side of the river, next to the bridge, Danilo I also built a one-storey house, popularly called Mostina. The bridge replaced the previous wooden bridge across the river, which was built by his predecessor Petar II Petrović-Njegoš. Rijeka Crnojevića’s bridge is a double-arched limestone bridge. Its total length is 43 meters.